Home » All Forums » [Miscellaneous Forums] » Fast Food Franchises & Non-Roadfood Chains » The last McDonald's that offers pizza? Hot!The last McDonald's that offers pizza? The last McDonald's that offers pizza? 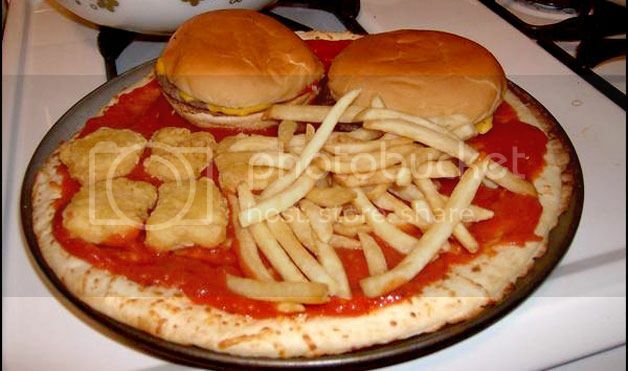 McDonald's has also attempted pizza at various times, with an apple-pie–like McPizza and more conventional McDonald's Pizza. A line of personal-sized pizzas was first seen in the late 1970s in test-market stores near interstate highways around Milwaukee and Madison. 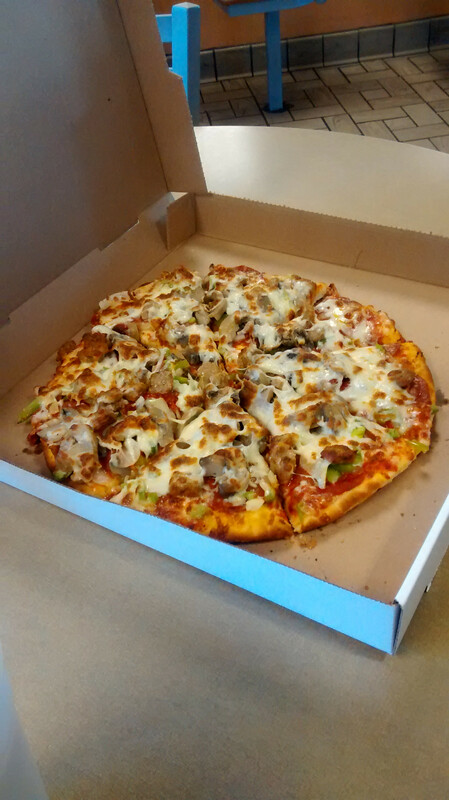 In Canada (c. 1992–99), the pizza originally began as a family-sized pizza that was brought out to the table by an employee and placed on a raised rack in the centre of the table. Later it was scaled down to a personal-sized pizza. However, variations have found their way into some international markets such as India (the pie-like "Pizza McPuff"). McDonald's also test marketed a 14-inch, round, traditional-style pizza in Evansville, Indiana, and nearby Owensboro, Kentucky, in 1989. By 1991, the McDonald's test markets for pizza had grown to over 500 McDonald's locations before the pizza test was placed on hold. Pizza was discontinued in most restaurants by 2000. The reason for eliminating the pizza from the menu was that the time to cook a pizza took 11 minutes, and McDonalds wanted to keep its reputation for fast service. Some, like the McDonald's located in Pomeroy, Ohio, still offer family size and personal size pizza as of February 26, 2013. The image from Foursquare below confirms it - but try as I might, I can't find an image of the actual current product. Any Roadfooders near the area feel like checking it out? I mean, yeah, it's fast food, fast food pizza, anathema to many of us, but still... aren't you a little bit curious? No...no how....no way.......never ever....uh uh!!!!!!!!! "McDonald's also test marketed a 14-inch, round, traditional-style pizza in Evansville, Indiana, and nearby Owensboro, Kentucky, in 1989." I remember that. They also had a test outlet in the two McDonald's outlets here in Henderson, KY, which is located between the two cities. The pizza was nothing to write home about. It wasn't bad--just sort of bland. Any Roadfooders near the area feel like checking it out? I mean, yeah, it's fast food, fast food pizza, anathema to many of us, but still... aren't you a little bit curious? Sure, but unfortunately my annual Ohio trip won't take me any closer than about 150 miles to Pomeroy so it's not really a doable thing. Google Maps shows Pomeroy as a pretty small town but it does have a Pizza Hut. I wonder how much revenue pizza generates for this particular McDonald's; my first thought was that if it's still on the menu maybe it's the only pizza option within a reasonable distance. There were some other places in neighboring towns about 10-15 minutes away, but yeah, pretty thin overall. I could see McD's pizza persisting simply because it's an additional option. The prices aren't bad either, according to the photo. $6 for a whole pizza, $1 for each additional topping? Little Caesars (which they don't have) is the only chain I know of in that range, without coupons. I remember eating pia atMcDonald,s in SimiValley a long time ago. I'm from Pomeroy Ohio and yes our McDonald's in Pomeroy Ohio does make Pizzas! Small and large. My family and I order the Large Pizza quite often. The Large pizza for anything on it is $ 6.00. I think it's really cool that my McDonald's is the only McDonald's that makes Pizzas! Hi jessicarussell539. Welcome to Roadfood. I haven't been down your way in a while. Pomeroy is a nice town. I'd be very interested in seeing what this pizza looks like! For what its worth, its pretty decent... but exactly what you'd expect from a pizza made by McDonald's. 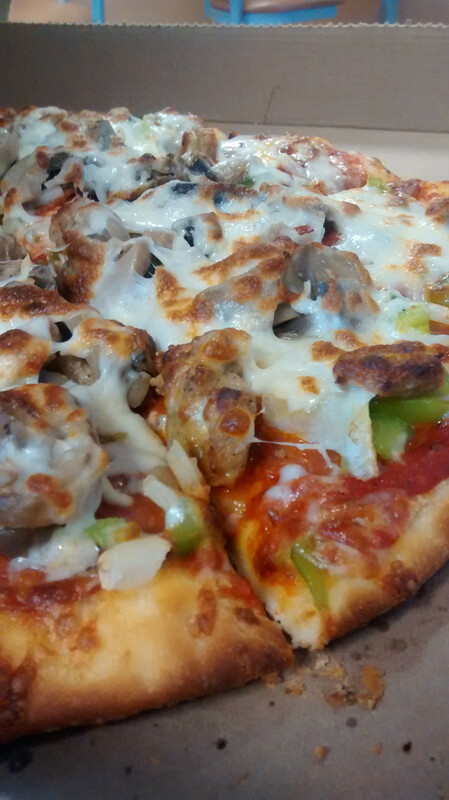 This pizza, and any others regardless of toppings, is only $6. In one breath you say it's pretty decent...then in the next you say it's what you'd expect from McDonalds...a contradiction if I ever heard one!!!!!!! Wow, that's a lot of exclamation points. It is decent, which is what one would expect from McDonald's. McD's food doesn't taste bad (who knew things jammed with salt, sugar, and fat would be tasty? Lmao), but it doesn't have much flavor depth. That's what one expects from McD's: A flashbang of yum, followed by indifference. In short, it's just okay. Nothing to write home about. We'll just have to differ...to me McDonald's is NOT decent tasting.....and ,oh God, it DOES taste bad.....and I bet most would agree.....and IT is NOT tasty!!!!!!!!!! It certainly looks better than I expected - I mean, it looks like a legit pizza, with real cheese and everything. Mushrooms are canned, but you'd expect that. Overall, it seems to have been assembled with more care than similarly-priced pizza from 7-11 or Little Caesars. And Mike, your description of how McD's tastes hit the nail on the head for me - it's pretty applicable to all fast food, although certain other chains give me "a flashbang of yum, followed by regret". Taco Bell does that to me sometimes: tastes good in the first few seconds, then further along I'm wondering why in the world I went there. But I inevitably go back. That McD's pizza could have looked like death in a box and I'd still have tried it, simply for the novelty of trying the only McD's pizza in the country. But it looks at least somewhat better than that. I think some splashes of the right hot sauce could elevate it. All their food looks good! Something happens to it from the counter to the table. To me it was a great place to stop with the kids, it made them happy. If the kids were happy, I was happy. If I have learned anything from Roadfood it's to plan ahead. Make time to take the path that's a mile or two off the freeway. You just may find some great local food and meet some interesting and friendly people. What made McDonald's popular over the years is cheap and fast food. People still want fast but they want it fresh cooked, hot and fast. As soon as McDonald's figures that out, they just may be around for another 50 years. McDonalds hasn't changed, people have! It doesn't really matter if the McDonalds pizza was the best in the world. It didn't fit with the model of why people stop there. I can tell you four words I have never heard while coming out of McDonald's "WOW! That was great!" Agreed...if I'm ever in the area I'll certainly keep it in mind. And I actually don't mind canned mushrooms (canned is better than none at all); if a pizza place offers them as well as fresh I'll often get both. Pictures look pretty good...thanks for taking the time to share them! Hey Mike - you made it to the front page of Reddit! Aaaaand it's gone. 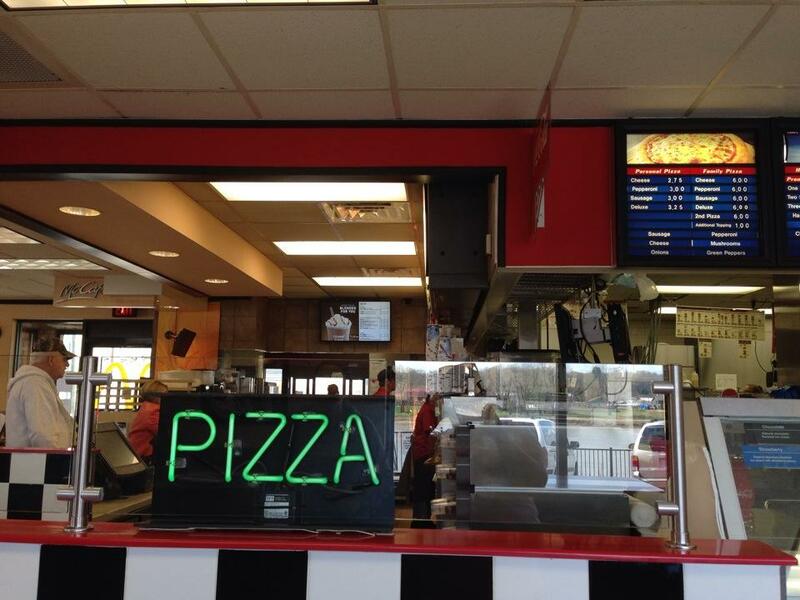 The Pomeroy location has stopped offering the pizza. Seems like corporate got wind of it and had them nix it.